Here we are less than six months after [the] first strategy review was completed and military commanders are now saying that the exact same strategy they proposed back in March, they need […] well above and beyond what they thought they needed. And so Mr. Obama is entitled to think twice about that. He is entitled to wonder just how precise is this military arithmetic? Just how promising is this counter-insurgency strategy anyway? McChrystal’s point is that it’s not simply “resources,” not just U.S. and NATO troops, that will settle the war. It’s also whether the Afghan government earns the trust of its people — whether the Afghan president and his entourage of ministers, governors, and warlords are willing — or are willing to be lured — to clean up their act, end their corrupt practices, and truly serve their people. When Obama says he needs to review the strategy before he decides on troop levels, he almost certainly means that he needs to assess whether a counterinsurgency strategy makes sense if the Afghan government — the entity that our troops would be propping up and aligning themselves with — is viewed by a wide swath of its own people as illegitimate. So how do we change that? This is the place where comparisons to Vietnam become hard to avoid. Diem was never a legitimate leader of South Vietnam, and after his assassination none of his successors were either. That made the war impossible to win. Now we’re in a different country but the same situation, and there’s little reason to believe that we’re any better at installing credible puppet governments today than we were 50 years ago. More troops won’t change that, as McChrystal concedes, but it’s not at all clear that a change in strategy will either. Certainly not the relatively modest changes McChrystal favors and certainly not in the timeframe he suggests. We’ve screwed up monumentally in Afghanistan, and rearranging the deck chairs just isn’t enough to turn things around. ….Instead of increasing troops, officials said, Mr. Biden proposed scaling back the overall American military presence. Rather than trying to protect the Afghan population from the Taliban, American forces would concentrate on strikes against Qaeda cells, primarily in Pakistan, using special forces, Predator missile attacks and other surgical tactics. ….A shift from a counterinsurgency strategy to a focus on counterterrorism would turn the administration’s current theory on its head….But the Afghan presidential election, widely marred by allegations of fraud, undermined the administration’s confidence that it had a reliable partner in President Hamid Karzai. 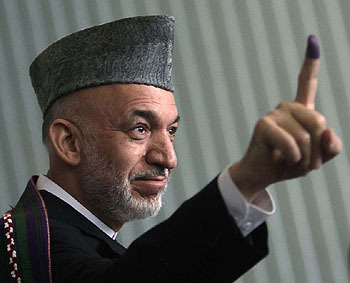 Mr. Obama and Mr. Biden already had raised doubts about Mr. Karzai, which were only exacerbated by the fear that even if he emerges from a runoff election, he will have little credibility with his own people. After eight years, the burden of proof is no longer on the skeptics. It’s now on those who think we can turn things around in Afghanistan. If McChrystal’s team can come up with a genuinely credible plan to make counterinsurgency work, that’s fine. But please: no more wishful thinking and no more demands from knee-jerk hawks that we fight forever no matter what. It’s time for a reality check and some tough decisions.